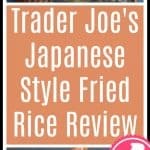 The verdict: Trader Joe’s offers the most number of rice dishes that I’ve ever seen at a grocery store. You can buy Jasmine Rice, Brown Rice, Chimichurri Rice, Chicken Fried Rice, Vegetable Fried Rice, Thai Shrimp Fried Rice, and this Japanese style fried rice (in addition to a few I might have forgotten about). 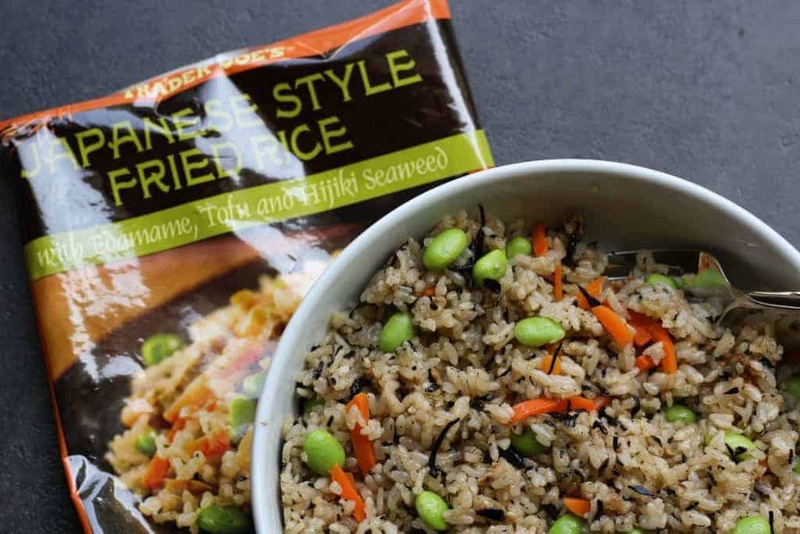 While each of their frozen rice varieties are pretty distinct from one another, this one does stand out. While the pictures on the bag is pretty close to what you can expect if you go to the store, there is one thing that stood out as missing: the tofu. While it might seem like it will have a lot in it, I assure you, that there wasn’t much tofu in any bag I’ve ever bought. So if you are vegan and need some protein, be sure to add your own. The fried tofu blended into the rice and was virtually indistinguishable from everything else. The three and half servings is actually pretty accurate in terms of the number of meals being served from this one bag. Preparing this couldn’t be easier. Cut a bit off of a corner and put it in the microwave. Makes for an easy dinner or a series of lunches. In terms of flavor, this is rice that is mixed with soy sauce. There are no shortage of edamame in this. Carrots are cut evenly so they heat up evenly and add a nice sweetness to this dish. The seaweed adds a familar umami (as does the soy sauce). Overall, this is one of my favorite frozen rice dishes. Priced at $2.99 this is a perennial favorite in my home. I enjoy it as a dish on its own or with some grilled chicken as a meal. Would I buy this again? 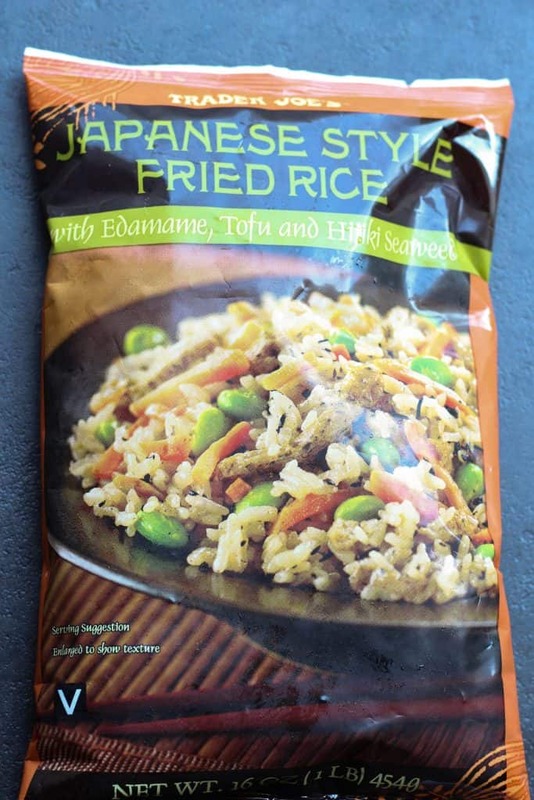 Yes, I’ve purchased Trader Joe’s Japanese Style Fried Rice several times and enjoy it even though there is a serious lack of tofu in it. Yay! Another yummy looking product with no garlic (hubby is allergic). Last night we ate Trader Joe’s French Onion soup. It was delicious! It comes frozen with croutons and cheese. I just baked it 40 mins in French onion soup bowls and it looked and tasted homemade. I should also mention that drizzling some of the green dragon hot sauce makes it even better. I always have this in my freezer! For a quick meal i add in more edamame or cubes of the prepared “savory tofu” that TJs sells. I put the hot fried ontop of a bowl of baby spinach so the spinach wilts a bit and adds more veggies to the meal. SO delicious! Yup. This is a staple in my household too. I haven’t seen the savory tofu. I’ll keep an eye out for that too. I never thought of putting spinach with it. That actually sounds pretty awesome. Thanks for sharing!